Move linked to budget constraints, lessons learned from Gaza war and deal to buy F-35 stealth fighters - possibly Washington snub? 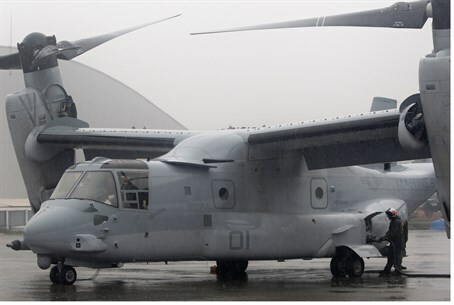 Defense Minister Moshe Ya'alon (Likud) is dropping the purchase of US V-22 Osprey aircraft, raising concerns that this could further chill already frosty relations with Washington, Israel Hayom daily said Thursday. The mass-circulation freesheet said Yaalon's decision went against the Israeli military's wishes. The paper linked the move to budget constraints, lessons learned from the 50-day summer war in Gaza, and the recent conclusion of an agreement to buy a second batch of costly Lockheed Martin F-35 stealth fighters. The V-22 Osprey is an advanced vertical takeoff and landing transport aircraft. Israel Hayom said the planned purchase of six Ospreys would have made Israel the first country outside the United States to deploy them. Following the Gaza offensive, Ya'alon chose to produce more home-built Namer (Leopard) heavy armored personnel carriers and increase stocks of precision munitions, it was reported. "Some are concerned that against the backdrop of rattled Israel-US relations the decision to cancel the purchase will anger the US administration," the paper's English-language website wrote. "Ya'alon will have to make the case to the US that his decision was made objectively and based on national interests alone." The Pentagon announced in January that it planned to sell six tilt-rotor Osprey aircraft to Israel in a deal worth $1.13 billion. Observers looking for non-objective reasons for the decision might point at the fact that Ya'alon was denied meetings with top American officials during his visit to the United States this week, according to the Associated Press, which cited officials in Washington. While Defense Minister Ya'alon did see US Defense Secretary Chuck Hagel and US Ambassador to the UN Samantha Power, the officials said the White House and State Department rejected Israeli proposals for meetings with Vice President Joe Biden, national security adviser Susan Rice and Secretary of State John Kerry. The officials also revealed that the Obama administration had sought to stop Ya'alon from seeing Power, but the objections were made too late to cancel the meeting. US-Israel ties plunged to new lows this week when an anonymous senior official in President Barack Obama's administration was quoted in The Atlantic magazine as calling Netanyahu "a chickens**t" interested only in preserving his own political skin. Kerry on Thursday hit out at the reported slur against Netanyahu, calling it "disgraceful, unacceptable and damaging."